Governor Larry Hogan reaffirmed he would continue on the path that led him to be one of the most popular political leaders in the country during a press gaggle Wednesday, the day after he was elected to a historic second term. Governor Larry Hogan reaffirmed he would continue on the path that led him to be one of the most popular political leaders in the country during a press gaggle Wednesday, the day after he was elected to a historic second term . Hogan became the first Republican Governor to win re-election since Thomas McKeldin did so in 1954. He road high approval ratings and a bipartisan appeal to a decisive election win against Democratic Ben Jealous, a candidate painted as a potentially radical progressive compared to Hogan’s more measured governance. In a state where registered Democrats have a roughly two-to-one edge over registered Republicans, Hogan’s first four years were marked by picking and choosing his spots to battle with the Democratically controlled state legislature. He courted conservative Democrats, moderates, and independents to build his coalition. He said his ability to work across the political aisle was part of his appeal to state voters, and it could serve as a model for solving some of the ails that plague national politics. 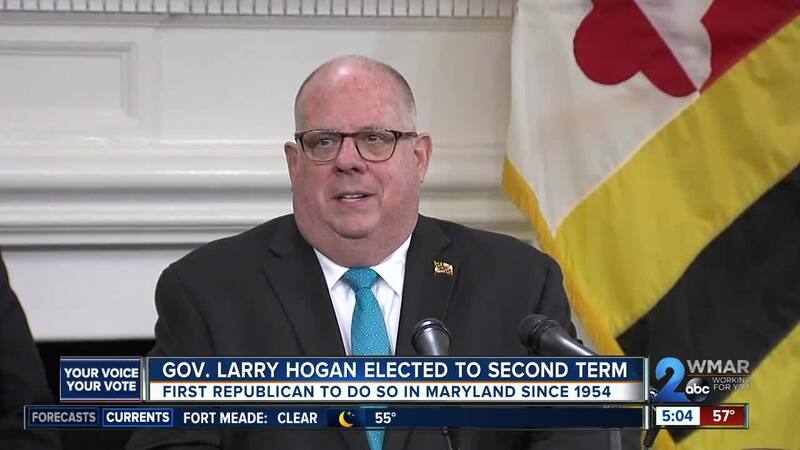 Despite Hogan’s overwhelming electoral success, his fellow Republicans were not able to follow suit. Though Andy Harris successfully defended his Congressional seat representing Maryland’s First District , fellow Republicans Allan H. Kittleman and Steven Schuh lost their incumbent bids for County Executive of Howard and Anne Arundel County’s respectively. State insurance commissioner Al Redmer, another Republican, also lost his battle for the open Baltimore County Executive seat, a race won by Democrat Johnny Olszewski . “There was just too much of an albatross around their neck from Washington to get them over the line,” Hogan said, referring to the specter of President Donald Trump, a highly unpopular figure in a state that voted resoundingly for Hillary Clinton in 2016. Hogan routinely tried to distance himself from the President during his campaigning and rarely weighed in on Trump-centric controversies during his first term. Hogan laid out his priorities as he readies for the legislature to reconvene in January, focusing on defending the Chesapeake Bay, pushing for more accountability from state schools, growing jobs, improving infrastructure, and redistricting efforts in a state he said is badly misaligned. The Governor also set his sites on Baltimore, and the continued problem of record crime. Despite the city’s murder rate being lower in 2018 than the year prior, 2017 was a record year for crime in the city. Hogan spoke of the need for more leadership, and the increased resources he was willing to bear, such as an already in the works partnership with 12 federal agencies. With a successful re-election campaign in the bag, Hogan demurred on the prospects of pursuing higher national office, remaining focused on the next four years in Annapolis. “We’ve got a lot of work to do between now and January,” Hogan said.